The “Crown Jewel” of our Bed sheet collection is this Elite Battenburg Lace. Elaborate and beautifully hand embroidered satin stitched floral accents. The full lace-edge is luxurious and intricate, complete with hand crafted lace brides and lace bars, and even laborious lace rings. The lace edge extends from end-to-end along the entire length of the flat sheet, which is, an incredible 90″ across. The widest section of the exquisite Battenburg lace measures from tip-to-tip 12″. 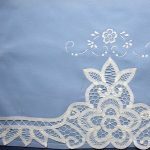 As for the matching Queen size pillow cases, the beautiful lace extends along the full length of the pillow, that is, 20″ across. The deepest Battenburg lace measures 8″. Imagine waking up in the morning wrapped in luxury and romance. A perfect gift for a bride. 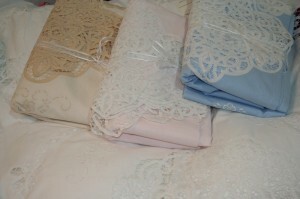 Available in 4 different colours : Classic White, Blue, Pink Lace, Vintage Ecru. 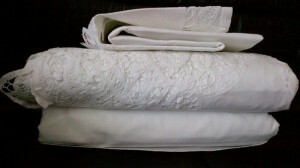 4-pieces sheet set, complete with elaborate hand embroidered & full lace-edged flat sheet, and matching Queen size pillow cases; fitted (regular), at an incredible value: CAN$269.95 for entire 4 pieces set ! Or, CAN$229.95 for Flat and pillow cases 3 pieces set ! To illustrate the premium quality of pure cotton thread woven into 100% cotton fabric, a picture will translate into a “thousand words”… Thickness (or height) of the entire set : Top flat sheet, fitted flat sheet, 2 pillow slips : measures 9″ high when folded into 10″ x 14”. weighing 4 lbs. 3 oz. For the colour Pink Lace : the color name pink lace for this pale tone of rose pink has been in use since 2001, when it was promulgated as one of the colors on the Xona.com colour list. We choose this shade of just a hint of pink which will transcend Time and never be out of style. 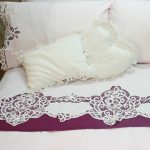 For a Pink and White décor, get this incredibly beautiful sheet set: Soft Pink coloured Cotton with elaborate White handmade Battenburg Lace border edge & hand embroidered white Satin-stitched flower accents for contrast. 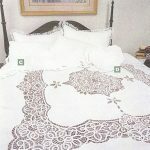 Complete Queen set with Queen size pillow cases of the same matching lace edge. Hand-stitched lace border on our sheet set hints at a restful night of romance & sweet dreams. We also offer more Elite Battenburg products to match! Yarn dyed natural cotton thread to ensure long lasting colour. Hand made Battenburg Lace full border edge on top sheet & cases. 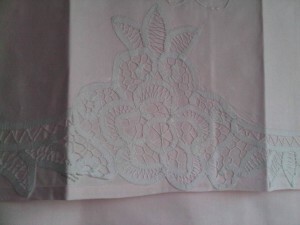 Pink Cotton with White Lace & White Satin-Stitched Embroidery. Choose 4 pieces (with fitted) or 3 pieces (NO fitted). 1 piece queen size : flat sheet only. Measurements are approximate with a variance of 10-15% variance.